The engine was so successful that Leonid Komarov immediately got a lot of followers. The editors received letters reports that in different parts of the country are similar — though more interesting, more sophisticated engines are successfully operated by Amateurs on a variety of cars: micro cars and motonartah, microplane and microperthite. The next step was the construction of the almost simultaneous three-cylinder engines, again on the basis of motorcycle parts, V. Stolyarchuk from Brest, Muscovite, O. Kucherenko and a team of students Arsen engineering College under the guidance of A. E. Yakovlev. It is interesting to note that V. Stolyarchuk and A. Kucherenko are laureates of all-Union review of scientific and technical creativity of youth — advanced combat squad of craftsmen “craftsmen Golden hands”. A logical continuation of this great creative work was to be the appearance of a boxer four-cylinder engine. Why boxer and not a radial or in-line arrangement of cylinders, legitimately asks the reader. To answer this question in a nutshell is impossible. Have to turn the pages of history of Russian and world motor industry in order to understand the continued interest of designers-minders to this scheme. Four-cylinder “opposite” air cooled is the easiest engine to install on motorcycles, microviscosity and microplane, snowmobiles and amphibious vehicles, air cushion and diskoplana. And when equipped with forced cooling so the engine fits very well into the design of the little micro-car and the minivan (in the latter case, due to the low height it can be installed under the floor of the car, the cabin will be plenty of usable area). Boxer engines allow a high degree of force, as the cylinder can be fastened to the crankcase through-bolt anchors. A — TOP VIEW: 1 — magneto “KATEK”, 2 — the shank of the crankshaft to drive the magneto, 3 — bearing crankshaft, 4 — large gear output shaft gear 5 — bolt crankcase halves, 6 — head cylinder, 7 — cylinder, 8 — piston, 9 — Carter 10 — cover threaded, 11 — neck of the crankshaft, 12 — rod, 13 — connecting rod opposite the cylinder, 14 — the neck of the crankshaft, 15 — cap screw opposite the crankshaft 16 of the ball bearing of the crankshaft 17 — pinion. 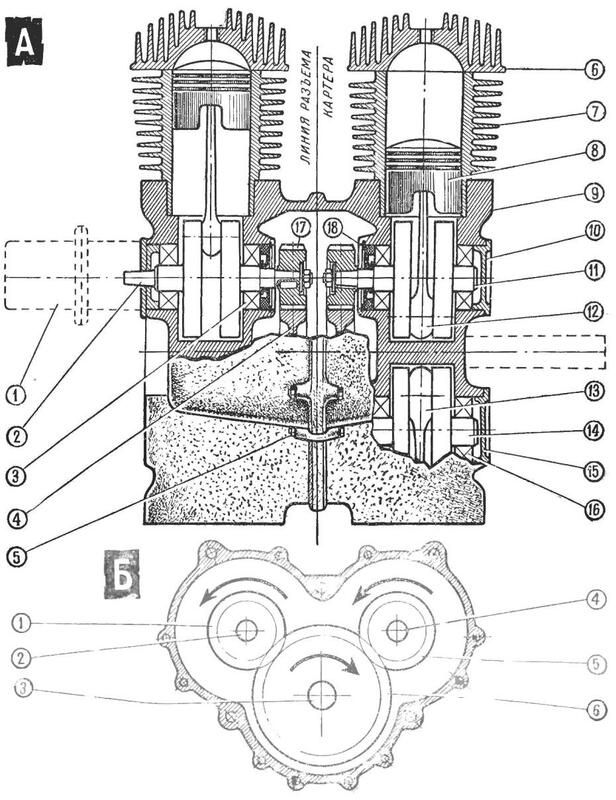 18 — crankshaft seal (the diagram shows only one group of cylinders). B — LINE CONNECTOR housing (rotated 90): 1 — pinion, 2 — the shank of the crankshaft 3 to the output shaft of the gearbox. 4 — shank opposite to the crankshaft, 5 — pinion, 6 — large gear output shaft gear. Soviet designers have paid enough attention to the development of the boxer engine. 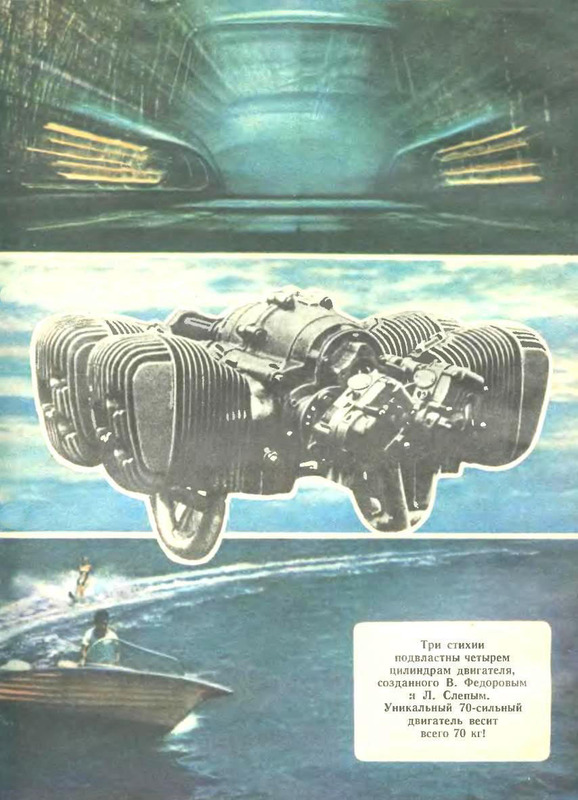 On the eve of the great Patriotic war on the basis of the outboard motor “LM-7” Rybinsk engine plant was created by a two-cylinder air-cooled engine “LM-8” for snowmobiles and microplane (called at the time “airplanes”). At working volume of 500 cm3 , this engine develops 22 HP at that time very good performance, especially if you consider that “LM-8” did not require high-octane fuel. In the postwar years, two-stroke two-cylinder boxer engine appeared on one of the new motorcycles. Then, the motor of this kind, suitably refined, was used on light helicopters “KA-10” construction. I. Kamov. Currently, the debugging and development of the boxer engine are conducted at several specialized enterprises in the USSR and abroad. The world famous steel four-cylinder boxer engine models of firms such as “Lycoming” and “continental”, “Volkswagen” and “BMW”. Unifying a number of important details, leading companies produce boxer engines in a large range of power, with a guaranteed interchangeability of assemblies and mechanisms not only within one “family” of engines, but of different series. 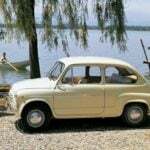 Today we offer our readers design a multi-purpose four-cylinder, two-stroke gasoline engine with 70 HP., developed and embodied in the young Moscow metal engineers V. Fedorov and Yu Blind. Two other pilots-glider pilots. 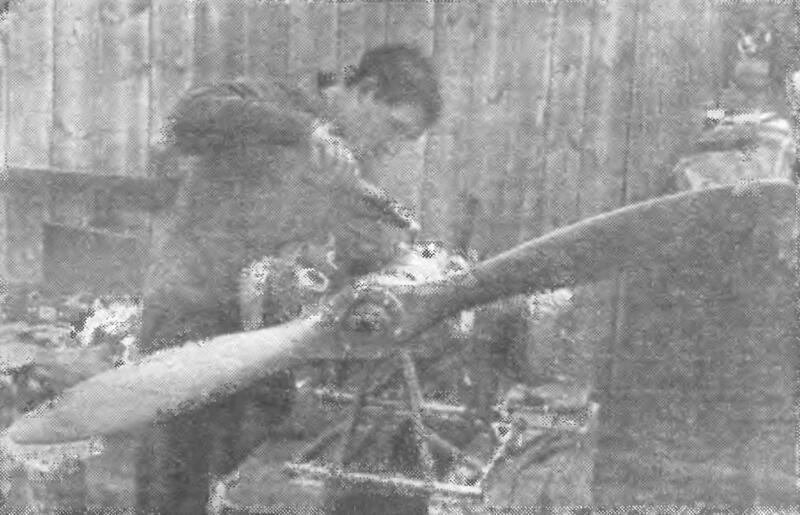 The engine they built for a glider of his own design. New engine on the test bench. Now it’s launched, and its designer, a young Moscow engineer V. Fedorov, will experience a few happy moments, so familiar to creative people! V. N. Fedorova is the first four-cylinder boxer type engine built in Amateur conditions. What is the Quartet? It’s four single cylinder motorcycle engine, United in a common housing. Crankshafts, connecting rods, pistons, cylinders, cylinder heads — from serial motorcycle “MZ-250”, manufactured in the GDR. The housing is symmetrical relative to the median vertical plane of the connector, consists of four parts. It is molded from an alloy of ALG-9, and then machined on milling and grinding machines. Pre-made wooden model, which was used for the Assembly of the entire cylinder group. Housing parts are joined together by six 12 mm studs and eight 8-mm bolts, forming four separate crank chamber and sump of the gear unit. The output axle of the crankshaft, cropped, and mounted gears being in constant mesh with a large gear of the output shaft. The reduction coefficient I = 0,44. Working cycles in the opposite cylinder the same, in the next — shifted by 180° rotation of the crankshaft. The engine carburetor has two of the same motorcycle “MZ-250”. Each serves two adjacent cylinders. The gear train is lubricated by oil MS poured into the cavity of the gearbox. The ignition is supplied from two aggregate dvuhosnovnyj magneto type “KATEK”, installed directly on the shank of the crankshaft opposite to the gear side. The design of the exhaust system depends on the type of machine that will be operated by the engine. For example, when you install it on a microplane sufficient short tubes, made locally, so exhaust gases got into the cockpit. 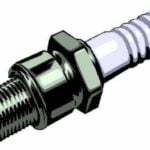 However, in all cases, you should locate the exhaust pipe so that they do not create harmful overheating of engine parts and sufficiently cooled themselves counter-flow of air. A characteristic feature of all these engines is the use of a large number of standard parts and assemblies from standard commercially available motorcycles and scooters. This greatly simplifies design, accelerates and reduces the cost of building prototypes, opening wide possibilities of the experiment, the search for optimal solutions. Thus, the work done by the designers-lovers, is of great importance. We can already draw some interesting comparisons and insights for future work in this direction. They will help to focus both in the development of new types of engines, and the launch of commercial production already proven in the Amateur practice models. Analyzing the work done by the enthusiasts of technical creativity in the field of special small-displacement motors, it’s safe to say that they have created samples of the most promising multipurpose internal combustion engines (the”classic” type) — two-, three-and four-cylinder. On the basic parameters, first turn on the power and specific gravity, they correspond largely to the requirements presented to them by the designers of micro cars, microplane, WUA and other self-propelled machinery, on the one hand, and fill the gap that exists now between the two groups of series-produced engines of industrial production on the other. In this regard, a logical question arises: whether the creation of more powerful engines Amateur design? Apparently not, and here is why: a further increase in capacity can be achieved either by increasing the cylinder capacity to the already tested scheme, either by increasing the number of cylinders in the block. However, both these areas do not promise good results. More correct way is to increase the power density while reducing weight. It is here that designers are expected by many untapped opportunities, such as tuned intake and exhaust, the use of once-through carburetors, etc. Very promising use in the construction of improvised units engines outboard motors. With small dimensions and weight of their force heads have a high litre capacity and satisfactory service life. They can find application in all kinds of machines, allowing the use of liquid cooling. The first successful development of this kind was done by one of the oldest enthusiasts of technical creativity, teacher A. S. Abramov, who built the children’s little micro-car with the engine 0t outboard motor “Surf”. We hope that A. S. Abramova are followers, and we ask our readers to tell us about their experiences of the use of power units of outboard motors on the micro cars, motonartah and other self-propelled machinery, and the use of blocks of these motors to build an improvised multi-cylinder engines. The most interesting correspondence will be published in the journal.